Nature’s most efficient means cooling is through the evaporation of water. Evaporative cooling works on the principle of heat absorption by moisture evaporation. It also happens on human skin, the body sweat and to cool temperature down. This process is same as you feel cooler when wind blowing from sea. 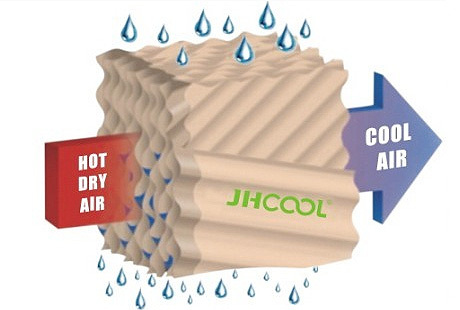 JH evaporative cooler produces effective cooling by combining a natural process-water evaporation-with a simple, reliable air-moving system. Fresh outsider air is filtered through the saturated evaporative media, cooled by evaporation, and circulated by a blower. Evaporative cooler is one of the longest history home appliance, even elder than air conditioner. It is called desert cooler in Middle East, and also is called swamp cooler in the US. 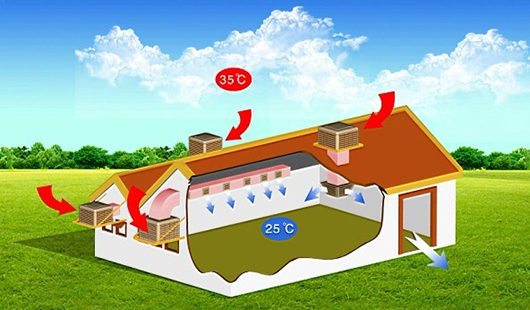 The frame of evaporative cooler is very simple. Water from the bottom pan of the unit is pumped to the top and allowed to flow down over the evaporation cooling pads of the spot cooler, evenly saturating the pads. Then, a powerful blower pulls air through the pads, forcing the water to evaporate which lowers the ambient temperature. The cooler air is then blown by the unit at a high velocity where you direct the cool air to go. JH evaporative coolers are ideal for larger open areas. Cool large areas such as warehouses, sidelines at sporting events, greenhouses, shop areas, assembly areas. Evaporative cooling system offer a low-cost alternative to air conditioning. Easy to set up on the wall, window and roof, not only provide cooling, but also provide good ventilation. They simoly use an internal or external water source to provide cooling.